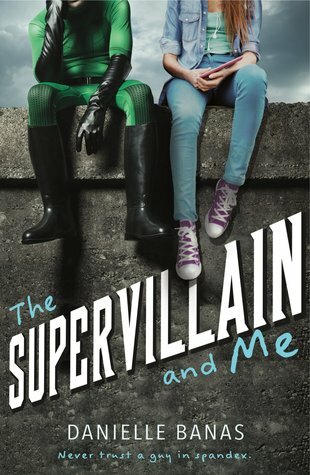 Review In A Nutshell: The Supervillain and Me is cute, but reads more as a younger-YA contemporary rather than a superhero novel. The Supervillain and Me follows Abby Hamilton, who lives in a world where superheroes are common, and one of them just so happens to be her brother. When she is saved from an attempted mugging by the town’s new supervillain, the Iron Phantom, he reveals that he isn’t committing the crimes attributed to him. As the two grow closer, they must unravel a mystery that threatens their town. The worldbuilding was pretty… blah. There is very little explained about the superheroes and their origins, so if you are looking for a marvel-esque origin story you won’t find one here. Also, this one town seems to have never heard of the concept of a supervillain? They were so surprised that a super could do bad things, and I just find that so hard to believe. How could a world where it seems that most major cities and towns have superheroes, but none of them have ever turned remotely evil? This book really does read like your average contemporary. While there are superheroes, there really isn’t any action until the last fifty pages or so, so don’t go into this book expecting a crazy wild adventure. The first part of the book really revolves around Abby and the Iron Phantom bonding, and her trying to guess who he is (which really just means a lot of scenes of her at school saying “hmmm this guy has the same eye color and vague shape, he must be him!”). If you are used to reading YA, or are paying any attention at all, then you probably know who the Iron Phantom is from the moment his Clark Kent side is introduced. There really are no surprises in this plot, at all. I found myself predicting all twists. There’s not much to say about the writing style here. It’s very basic and bland. The humor fell flat most of the time, most likely because it relied on the main character being clumsy or making a fool of herself. Some of the banter and character dialogue was enjoyable, but there was nothing really memorable. This book has a decent sized cast of characters. Abby is an okay protagonist, but very basic. She can be a bit cliche at times (clumsy, 1 dead parent, you know the type) but it is nice that she does have actual hobbies and skills outside of the what the plot requires. Her best friend is extremely forgettable (to be honest I read this book two days ago and I forgot her name). The Iron Phantom is an interesting character and makes a good love interest, but there honestly wasn’t anything about him that made me care. I did love Abby’s brother Connor. I know the author is writing a spin-off, and I really hope it’s about him. His character and journey were probably some of the more interesting aspects of this book. The Supervillain and Me disappointed in all the areas that would have made it memorable. However, it still is fun and would probably be more enjoyable for those looking for a lighter YA read.